The product of 11 years of research, The Story of Philosophy is an endlessly inspiring and instructive chronicle of the world’s greatest thinkers, from Socrates to Santayana. Written with exacting and scrupulous scholarship, it was designed both to command the respect of educators and to capture the interest of the layman. 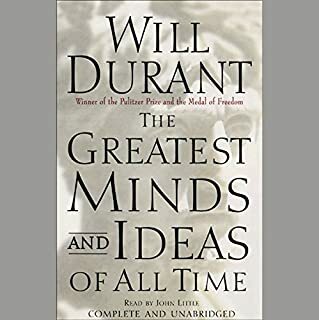 Will Durant (1885-1981) was awarded the Pulitzer Prize and the Presidential Medal of Freedom. He spent over 50 years writing his critically acclaimed 11-volume series The Story of Civilization. A champion of human-rights issues such as social reform and the brotherhood of man long before they were popular, he continues to educate and entertain readers and listeners worldwide through his writings. 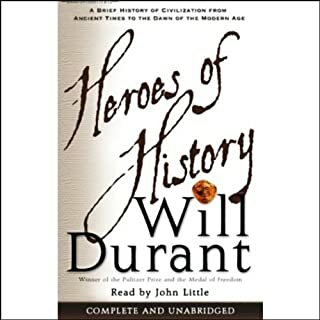 ©1926 Will Durant (P)2010 Blackstone Audio, Inc. I dont leave home without it. Its the only book that has permanent status on my Ipod. For me its that good. 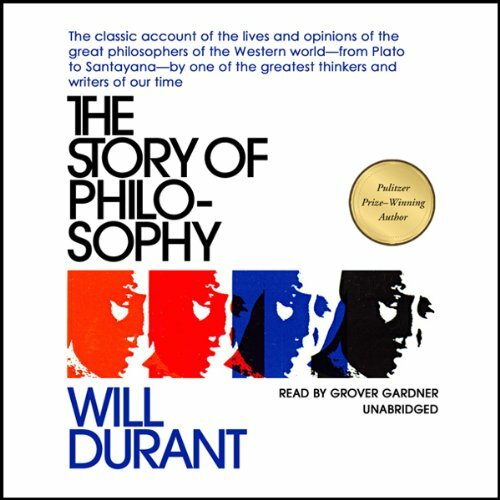 Will Durants amazing writing takes on philosophy, and gets read by Grover Gardner. That somehow creates a transcendent experience for me. Its become a kind of Lynus blanket. I just love it. Solid listen and masterly narration! I particularly enjoyed the section on Spinoza. The SoP gives an overview of the lives and works of the most renowned philosophers, and analyzes their ideas in terms of social, political, religious and psychological contexts. After reading this book, I feel like I'm a philosopher. Durant really knows how to engage the reader and make him feel smart. He gives enough biography and then summaries for each philosopher covered. The book really profits from the fact it was originally written in 1926 and I get to experience knowing the history that followed. He's such a good writer that the book stands up regardless of the unfolding history. Beginners start here! This is the one you want! 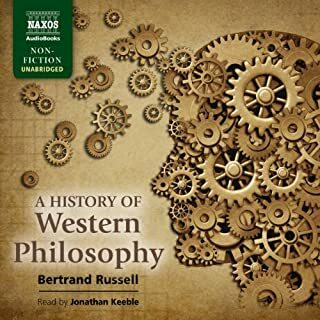 I picked up this audiobook because I wanted to begin studying philosophy and I needed a starting point. I am not disappointed. Durant gave me the direction I was seeking and a lot more. One of the most valuable things it provides is the context in which each philosopher wrote their philosophy. Durant shows how the time and place of each philosopher affected each work. He also highlights the influence of other philosophers in each work.The great works of philosophy weren't created in a vacuum. 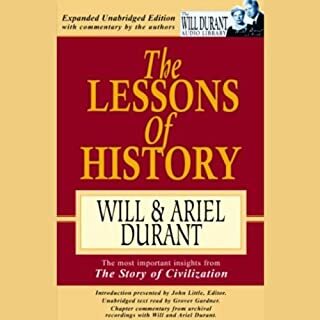 I had never heard of Will Durant but as I listened I got the impression that whoever this guy was he really did his homework. How little did I know! Suffice to say that I believe he is qualified to write such an ambitious work. Look him up on Wikipedia if you are as ignorant as I. And what a narration! I can't speak highly enough of the way this sometimes difficult work was tackled by Gardner. I don't know how he did it, it's like he wrote the book himself and was conveying his own thoughts on the complicated mind of Kant or Nietzsche. If you don't know much about philosophy, you really can't go wrong with using this as a starting or reference point. 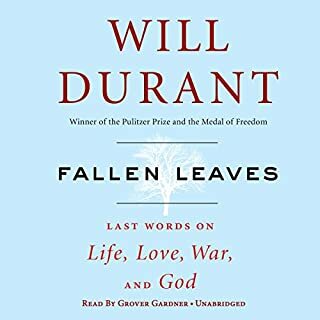 I imagine even those with experience in the field will find Durant's insight beneficial. I was greatly pleased to find William James included in the discussion, but was disappointed not to find more on Descartes, Hume, Locke, and others. "Philosophers profiled are, in order: Plato, Aristotle, Francis Bacon, Baruch Spinoza (with a section on Descartes), Voltaire (with a section on Rousseau), Immanuel Kant (with a section on Hegel), Arthur Schopenhauer, Herbert Spencer, and Friedrich Nietzsche." Also Henri Bergson, Benedetto Croce, Bertrand Russell, George Santayana, William James, and John Dewey. as good as it gets !! take a fascinating topic and match it to a truly unique writer of matchless finesse and warranted worship and this little wonder is what you get. I really like Will Durant's writting style. The book was interesting from start to finish. For me this was a great first book about the greater philosophers and provided ideas for further reading. I think Grover Gardner's narration was first rate and added to the listening pleasure. This is early Durant and his depth and style improved in his later works. This volume is also quite selective including only a few of the most important or pivotal Philosophers and it was written in 1924 thus it does not cover later philosophers. I was more than a bit surprised by the little jump between Aristotle (300 BCE) and Francis Bacon (1600 CE). Nevertheless what is there is fantastic, I only wish there was more, much, much more. 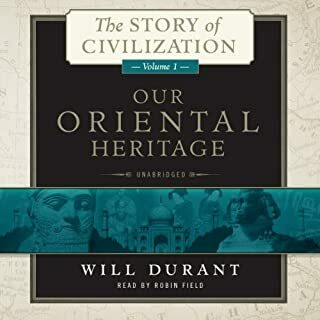 I recommend reading this before Durant’s monumental History of Civilization series. Though bias, the story of philosophy is a very good introduction to a beginner. It is very useful to anybody who wants to extend the basic understanding of how philosopher's ideas helped to shape human civilization. Narration is so good. It feels like I am listening my favorite music. These three volumes are a very pleasant easy ride through the philosophies of Plato & Aristotle (in detail), and then Bacon, Spinoza, Voltaire, Schopenhauer, Spencer, Nietzsche and on into 'contemporary' i.e. early 20th century European (Bergson, Croce and Russell) and US philosophers (James & Dewey). The thing is they are a very odd selection to choose from, and not necessarily the key figures who have shaped Western thinking! However, it is an interesting journey, well told... and well read with authoritative american easiness. I found myself drifting into a reverie during some bits, and it didn't seem to matter. The book is not a concise set of factoids, but a gentle swim through the enlightenment in some slightly strange company! This is a wonderful book; beautifully written and narrated. Not only does the author manage to draw you through the metaphysical mazes that these men dream up (and yes, they’re all men) but he also humanises the people, and put their lives into historical and social context. Whether it’s the spark and sizzle of Voltaire, or the repulsive (to me, at least) doctrine that Nietzsche espoused, you can’t help but empathise with them. Thoroughly enjoyable - if at times quite hard work (Kant comes to mind) - I’d recommend this classic work to anyone attempting to find a way into philosophy. Very good book but the voice is annoying. My apologies, Grover Gardner, honestly, but please please stop reading audibooks. You sound like a computer program reading out text. It ruined this book for me which, because of your voice, I still have not finished. What I have heard of Durant so far is intelligent, extremely eloquent, very easy to follow and supremely interesting. Hats off to the author, but the voice, oh my god, the voice. The book was first published in 1924. The author tells the history of philosophy through the life and work of philosophers he considers great. The story of each philosopher's life and the summary of his philosophical views and contributions is followed by critique section where the author discusses the legacy of the philosopher's work. Being written in 1924, the chapter on Nietzsche misses any reference to the usage of his teachings made by Nazism. At the same time, probably because of the later editions, it is mentioned that Bergson died in 1941 and Sanatayana in 1952. So there is something chillingly unsatisfying in the chapter on Nietzsche left unupdated, in view of future developments. I loved that for each philosopher the author discussed the relationship between his personality and his philosophy, how his philosophy is influenced by his personality and is very much its product. What I did not like was the author's petty and narrow-minded contempt towards mathematics, expressed on many occasions, his inability to accept that pure mathematics can be not less beautiful than philosophical suppositions. More than once he states that logic is "the most boring part of philosophy" (obviously, because of its close relationship with mathematics). According to Will Durant, Bertrand Russel rose to greatness only after he left mathematical logic behind and went into "pure" philosophy. An excellent work that would serve as both an introduction to some of key themes in Western philosophical thought since the pre-Socratics for the uninitiated or as a consolidation of these key themes to anyone not already an expert in the field. It is not a comprehensive introduction but instead focusses on the development of significant themes. The book works through the historical and political context of the development of epistemological thought and does so (with the justifable exception of Kant!) mostly in the philosophers' own words. What makes the book outstanding is that it deals not only with some of the better known names, such as Plato and Kant, but misses out some of the more obvious names (such as Descartes) to develop their thought through the work of brilliant and often overlooked modern thinkers, such as William James. Excellently read and compelling listening. One of the best summative accounts of philosophy I've come across. If you are at all interested in philosophy you should download this. I loved this audiobook. It is obviously a well-written piece to begin with, and the narration was spot-on. I am now, finally, fascinated by philosophy, and will continue to pursue the subject happily and eagerly thanks to the foundation and motivation this book has provided. Will Durant makes the philosopher subjects of his book come to life. The best overview of western philosophy yet. Struggling to go on after 3 Chapters, too dry and too formal, I don't get a sense of what the philosopher is really like as a real person.